Once upon a time in a company far, far away, I needed to find a way to have users automatically logon to a Remote Desktop session with a specific set of credentials. I searched everywhere, and although I did find some tools, none of them were exactly what I was looking for. So I decided to make one myself. With the help of a lot of information on the web, I managed to write my own utility, saving me tons of work. Login automatically from the command line. 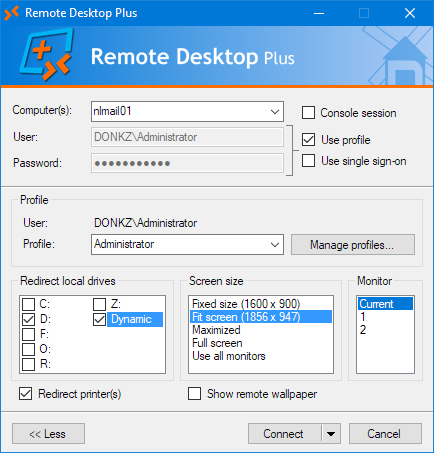 Remote Desktop Plus (RDP+) is not a clone or copy of Remote Desktop. It’s a feature-filled wrapper for the normal Remote Desktop client (mstsc.exe) on your computer and does not use an own implementation of the RDP protocol. RDP+ has a very small footprint. It consists of a single file, less than 300 KB. No installation required on the client. Automatically trusts all local resources and the remote computer. No more annoying questions like: Do you trust the computer you are connecting to? Passwords entered from the command line can be encrypted for enhanced security. Useful when starting Remote Desktop from batch files or published applications (Citrix). Supports the single sign-on functionality provided by CredSSP, if available on your system and properly configured. Ever had to login to multiple servers at once? Just enter those servers separated by commas and off you go. Supports connecting using URI hyperlinks, with acces to all command line parameters for RDP+ (rdp://fileserver1/?u=support&[email protected]&fit=5&drives&noprinters&mon=2). Supports connecting through a Remote Desktop Gateway server. Accepts both /console and /admin. No need to remember which version of Remote Desktop and/or Windows you’re running. Remote Desktop Plus also has a load balancing and (as of version 6.2) a failover feature. Specify multiple servers and RDP+ will randomly pick one of the servers to connect to. If this server is unreachable, RDP+ will skip it and cycle trough the other servers in the list, until it finds a responsive one. You can use this for example for legacy RemoteApps which are hosted on multiple servers without a session broker. Allows you to specify in the command line which drives or drive types to redirect and/or which drive(s) to exclude from redirection. Supports launching and autologin of RemoteApps. Supports specifying a startup program (i.e. alternate shell) from the command line. You can use both local and remote environment variables in the command. Allows you to save credentials (securely) in profiles. Profiles normally only work for the user who saved them and only on the computer on which they were saved. 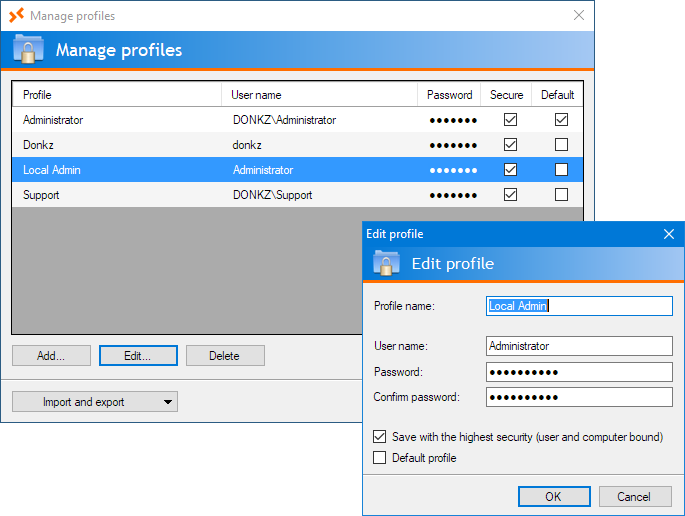 Profiles can be useful when administering a large amount of computers from a single point of administration. Changed the password for Administrator? Just edit the profile and you’re done. Ability to save frequently used connections as favorites for easy launching. Launch favorites from the command line. Some settings and options can be controlled through Group Policies. Group Policy templates for these settings are available for download on the site. Allows setting default options through either the registry, Group Policies or an enviroment variable. 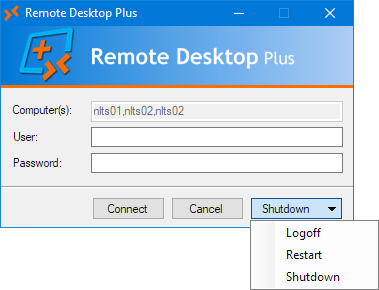 Remote Desktop Plus features a special restricted kiosk mode in which only the computer, username, password, or any combination thereof can be changed. When used as a published application, this allows you to grant (internal or external) support departments remote access to a range of servers in a much safer way. Has the ability to disable the close button in the title bar and remove the connection bar, thus forcing users to logoff gracefully instead of just disconnecting and leaving their remote sessions open. You can specify a range of computers the user is allowed to connect to. Any attempt to connect to computers not in the list will be denied. Has the ability to log all connections in a log file or the event log. Can set the working screen size to either the maximum available size (so it looks like a normal maximized application) or to a adjustable size – by setting either a margin or specifying a percentage of the screen – so you can still move it around a bit. When using multiple monitors, you can specify on which monitor the Remote Desktop session should be started. When using custom .rdp files, RDP+ will save valuable text space in the task bar by not displaying the name of the .rdp file in the title bar. You can set your own title bar text and specify your own icon. Still missing some command line parameters? RDP+ supports every option supported by the Remote Desktop .rdp file, using a special command line parameter. This gives you an unprecedented control over every aspect of the session, straight from the command line and without the need for specific RDP+ command line switches. Features an optional system tray icon for launching and managing your favorites, and for quickly switching to currently active Remote Desktop sessions. Contains no spyware, adware, browser toolbars, nag screens, phone home mechanisms or any of that stuff. And it never will. "connection file" The name of a .rdp file to be used for the connection. /v:computer[:port][,…] Specifies the remote computer(s) to which you want to connect. /u:username The username to be used for logging in to the specified computer. /p:password The password to be used for the automatic logon. /pe:encrypted_password Specifies an encrypted password for enhanced security. Use the option in the system menu to generate. Also forces kiosk mode. /i[mport][:profile] Read username and password from the specified (or default) profile. /sso Use CredSSP single sign-on. Only works when properly configured and when supported by the client. /domain[:domain] Specifies an optional default domain for the user. Defaults to the domain of the current user. /console or /admin Connects you to the console/administrative session of a server running Windows Server 2003 or higher. /[no]printers Enforce or disable printer redirection. /drives[:[-]drive[,…]] Enforce or disable drive redirection for the specified drives or drive types. /[no]sound Enable or disable sound from the remote computer to be played on the local computer. /[no]wallpaper Enforce or suppress displaying the remote computer’s wallpaper. /f or /fullscreen Start Remote Desktop in full-screen mode. /fit[:fitvalue] Fit the remote screen size to the local screen. Enter a margin in pixels or a percentage of the local screen. /max Fit the remote screen to its maximum size. /w:widthvalue Specifies the width of the Remote Desktop session window, in pixels or as percentage of the screen. /h:heightvalue Specifies the height of the Remote Desktop session window, in pixels or as percentage of the screen. /multimon or /span Set the Remote Desktop session monitor layout identical to that of the client. /pos:location Specifies the starting location of the session window. Use either x,y coordinates or ‘center’. /mon:monitor Start session on specified monitor number. Use ‘current’ to use the currently active monitor. /[program]title:"title text" Text to be displayed in the task and title bar for the session (/title) or the GUI (/programtitle). /[program]icon:"icon file[,index]" Icon to be displayed in the task and title bar for the session (/icon) or the GUI (/programicon). /start:"program" Specifies the remote program to use as shell. /noclose Disable the close button in the title bar. Also removes all buttons in the connection bar. /ontop Force the Remote Desktop session window to be always on top. Also disables the minimize button and removes all buttons in the connection bar. /wait Wait for the Remote Desktop session to end before continuing. /disconnect[:seconds] Disconnect the session automatically after the specified amount of seconds. Default is 10 seconds. /remoteapp:"||remoteapp" Specifies the RemoteApp to launch at the remote computer. /lb Use load balancing to connect to one of the specified remote computers. /fo Use the specified remote computers in a failover mode and connect to the first responding server in the list. /cb Use a Remote Desktop Connection Broker. The target computer must be the name of the farm. /t[:seconds] Try to connect to the computer indefinitely or for the specified amount of seconds until a connection is established. /rdgateway:computer Connect through the specified Remote Desktop Gateway. /o:"option[,…]" Specify one or more extended options in .rdp file syntax format. /gui[:loop] Force displaying the GUI. Use the loop parameter to return to the GUI after the session has ended. /kiosk[:[c][u][p]] Restrict the GUI to a mode in which only the computer (c), user (u) and/or password (p) can be entered. Defaults to c(omputer). /log[:"log file"] Log all started sessions in the specified file. Defaults to rdp.log in the directory containing the program. /eventlog Log all started sessions in the Application event log of the local computer. /tray Display a system tray icon for access to your favorites or any active Remote Desktop session. /register Register the .rdpc command file extension and add the program to the search path. /batch Suppress all standard error message popups. Errors can be handled through the exit codes. @"command file" Read command line arguments or extended options from the specified file. /fav:favorite Directly starts the specified favorite. Additional command line arguments are allowed. /-[option|*] Negate previous corresponding option from the command line chain. Use /-* to negate all previous options. rdp /i:"Domain Admin" /fit /drives /noprinters /title:"$COMPUTERNAME$ ($USERNAME$) – Remote Desktop"
rdp /v:nldmz01 /u:donkz\dmz /p:[email protected]! /start:"mstsc \\nlfps01\config$\RDP\DMZ.rdp /f"
/start:"C:\Program Files\Internet Explorer\iexplore.exe -k http://www.microsoft.com"
rdp /fav:"Batch server" /-pos /fit /title:"$FAVORITE$"
rdp /kiosk /sso /allowed:nlrds* /programtitle:"Remote Support for %USERDOMAIN%" /programicon:"D:\Icons\Remote.ico"
Normally profiles are saved with the highest level of security, which means they can only be used using the account which created them and only on the computer they were created on. You can also save profiles using a less strict security, which means they’ll be available on any other computer and will ‘roam’ with you. Please note however that because no external password key is used, a determined individual with the right tools (debuggers, disassemblers), the right knowledge of programming, access to the registry or computer of the user, and some other ingredients, could potentially break the encryption, so use this option with care. Also available is the add-on tool RDPProfile.exe, which allows you to automatically create profiles from the command line. You could use this from a login script to pre-populate some profiles for end users. If you need to use double quotes in the /start startup program, you have to put a backslash (\) in front of each quote. You can also use environment variables in your command, both local and from the remote computer. To use remote environment variables, you must precede the percent signs with a backslash. 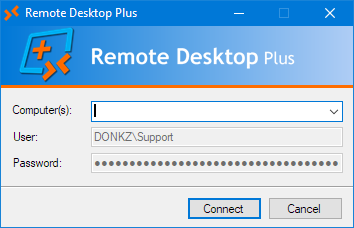 Combined example: rdp /v:nlapp03 /u:donkzdomain\helpdesk /start:""C:\Program Files\Remote Control\rc.exe" "\\nlfps01\Config$\RC\\%COMPUTERNAME\%-%USERNAME%.cfg""
If Remote Desktop Plus is started by user JohnDoe, the last part of the command will be expanded to "\\nlfps01\Config$\RC\NLAPP03-JohnDoe.cfg". %s: Will be expanded to the server name you’ve connected to. %u: Will be expanded to the username used to login to the remote computer. 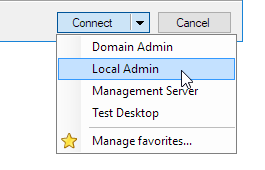 Example: rdp /i:"Domain Admin" /fit /title:"%s (%u) – Remote Desktop"
When connecting to the server nlfps01, this would result in the title bar text nlfps01 (DONKZDOMAIN\Administrator) – Remote Desktop. As of version 7.0, you can also use /programtitle. This will set the title for the RDP+ program itself. When running in kiosk mode, this will also change the text in de logo banner. You can also use your own icon for the session by using the option /icon. This can be either a normal icon file (G:\Icons\Remote.ico) or an executable or .dll file (%ProgramFiles%\Internet Explorer\iexplore.exe). For files containing multiple icons, you can specify the desired icon using its index (%WINDIR%\System32\shell32.dll,43). Please note that using /icon will also force an implied /wait, due to the way Windows retains (or does not retain) dynamically changed icons when the program which requested the changes is closed. Starting with version 7.0, you can also use /programicon to change the icon of RDP+ itself. 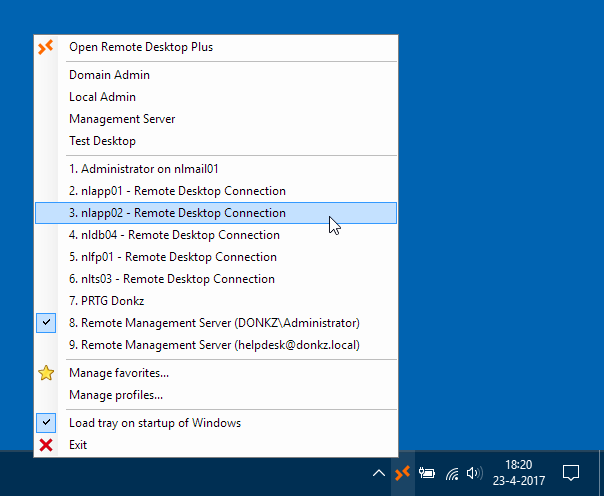 You can start a RemoteApp with Remote Desktop Plus, either from the command line or specified in the .rdp file. You can enter the RemoteApp using either its name ("||FileZilla") or the full path to the executable (C:\Windows\System32\Notepad.exe). When using the name, always enclose it between double quotes, otherwise your system may confuse the double pipe signs with the double pipes used in batch scripting. All options concerning the screen (like /fit and /mon) are ignored when using RemoteApps. The same goes for /title and /icon. Due to the way the Remote Desktop client launches all RemoteApps in a general, embedded instance of mstsc.exe, the option /wait is also not supported. Remote Desktop Plus can login to remote servers through a Remote Desktop Gateway. You can use the option /rdgateway to specify the Remote Desktop Gateway server to use. There are no other command line switches, so these must be configured from the normal Remote Desktop client and saved in a .rdp file, or entered through the /o option. When you select the option Use my RD Gateway credentials for the remote computer, RDP+ will also automatically login to the RD Gateway. If not, you will be prompted for credentials. 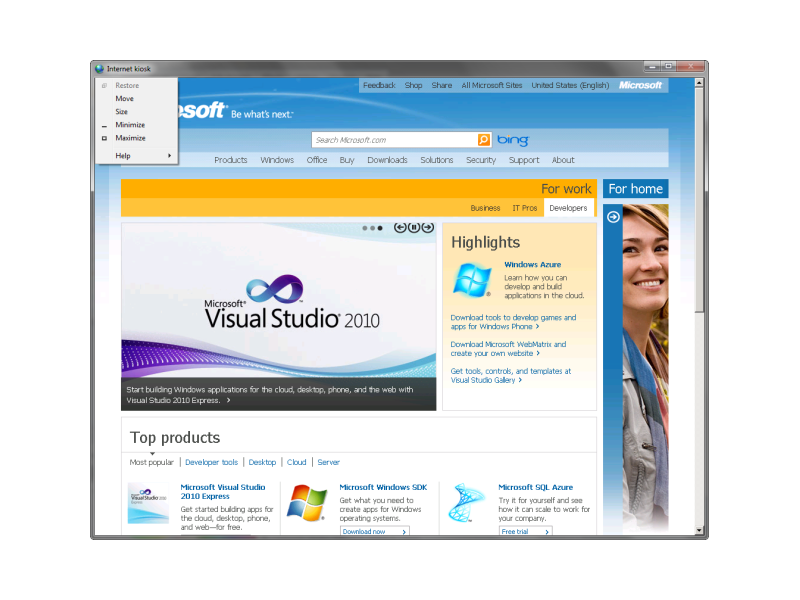 Starting with version 7.0, Remote Desktop Plus supports logging in to remote computers using the single sign-on (SSO) provided by Windows’ CredSSP. To use SSO some requirements have to be met, both on the client computer and the target. The client computer must be joined to a domain. The logged in user must be a domain user. The client computer must have Remote Desktop Connection 7.0 or higher installed. The target computer must also be domain joined and should be running Windows 2008 or higher. On the target computer, the security layer of the RDP-Tcp connection must be set to either Negotiate or SSL (TLS 1.0). On the client computer, credential delegation must be configured trough a group policy. Option to modify: Allow Delegating Default CredentialsAdd the target computer(s) using the prefix TERMSRV/ with optional wildcards. For example: TERMSRV/nlapp01, TERMSRV/*.donkz.local or even TERMSRV/*. RDP+ will check for the first three requirements. If they are not met, the GUI will not show the option for single sign-on. To use SSO from the command line, you can use the switch /sso. With the kiosk mode, you can set the GUI to a special restricted mode, in which only the fields for the target computer, username and password are shown. Using a 3-character ‘mask’, you can enable or disable any of the three fields. Each character in the mask stands for one of the three fields (computername, username, password). A 1 will enable the field, a 0 will disable it. As of version 6.2, you can also use the first letters of the field(s) you’d like to enable as the mask: c(omputer), u(ser) and/or p(assword). For example, /kiosk:011 or /kiosk:up will disable the computername field and only allow the user to enter the username and password. The kiosk mode will default to 100 (or c) when a mask has not been specified. Using the /allowed command line option, you can restrict users to only a selected range of computers. If the user tries to connect to a computer which is not in the allowed target list, the connection will be denied. This can be especially useful for publishing RDP+ to ‘untrusted’ users. You can use both wildcards and regular expressions in the list. RDP+ will also try to translate hostnames to IP addresses and vice versa for its matching. So for example, when using /kiosk:100 /allowed:127.0.0. *, a target computer of localhost will be considered valid. Enclose targets in parentheses to use regular expressions. Environment variables are also supported. Note: When using the pipe sign (|) in a regular expression, be sure to enclose the entire string in double quotes to prevent conflicts with batch scripting. You can also use the /listallowed command. This will transform the editable computer textbox in the GUI to a listbox with only the allowed computers listed. This can be more user friendly for third parties. Please note however that wild cards and regular expressions are not supported in this mode. You can specify the drives you want to redirect to the remote computer by using the /drives option. Drives can be specified either by name or by drive type (Fixed, Removable, Network, CD-ROM). To redirect drives that get plugged in later, you can use the drive type Dynamic. You can also exclude certain drives by preceding them with the minus sign. For example, /drives:fixed,-c:,p: will redirect drive P: and all fixed drives except C:. If you don’t specify any drive or type, /drives will default to all drives, including the ones plugged in later. By using the /o switch, you can specify every option supported by the .rdp file. Options should be given in the exact same syntax as used in .rdp files. You can specify multiple options by separating them by commas. To use commas within options, precede them with a backslash. Examples: rdp /start:terminal.exe /o:"shell working directory:s:H:\My Documents, redirectcomports:i:1″ rdp /remoteapp:"||ProdDB" /o:"remoteapplicationcmdline:s:proddb, sqlsa, [email protected], remoteapplicationname:s:Production Database"
The native RDP+ command line switches always take precedence over the /o options. So if you use rdp /printers /o:"redirectprinters:i:0″, then /printers will win. For an overview of (most of) the possible settings, you may find this page useful. %s: Will be expanded to the server name you’re connecting to. %c: Will be expanded to the name of the local client computer. When starting RDP+ locally, this will be the same as %COMPUTERNAME%. When starting RDP+ from within a Terminal Server or Citrix session, %c will contain the computername of the originating client computer (i.e. %CLIENTNAME%). %y: The 4-digit representation of the current year. %m: The 2-digit representation of the current month. %d: The 2-digit representation of the current day. When connecting to the server nlfps01 on the 30th of December, 2015, this would result in the log file 20151230-nlfps01.log being used. The semi-colon delimited log file contains all kinds of information about the computer and user which started the session, and information about the target computer and how the session was started. When RDP+ is launched from within a Terminal Server or Citrix session, it will also log the computername and IP address of the originating client. This can also be useful when using thinclients. Starting a new ‘blank’ instance of RDP+. Quickly switching to currently active Remote Desktop sessions. Automatically load the tray when you start your computer. See which Remote Desktop session you had active last, or by doubleclicking the tray icon, immediately switch to the last active session. When using the kiosk mode, the system tray reverts to a simpler mode, in which only the active sessions are available. When creating favorites, you have the option to save them with the option Save secured (user and computer bound). This means the favorite is only available on the computer it was created on. Use this option when you have specified sensitive passwords in the command line. When not saving it as a secure favorite, the favorite will be available on any computer you logon to when using roaming profiles. It will be saved using the same encryption /pe or Gencrypt uses, so it is still secure from prying eyes. If you regularly use the same command line parameters, you can also put them in a separate file and specify this file with the @-parameter. RDP+ will then use the contents as its command line parameters. You can also put normal .rdp file style options in the command file, without having to precede them with /o. This way you can use the command file as a master .rdp file. Comments can be added by starting the comment line with a semi-colon. /fit /noprinters /drives:fixed /icon:Company.ico /title:"%u on %s – Remote Desktop"
Tip: Use .rdpc as the suffix for the file and run RDP+ with the command line /register once to register the .rdpc extension to RDP+. This allows you to double click command files to immediately launch RDP+ and have the command files shown in the recent files when pinning RDP+ to the Start Menu. Starting with RDP+ 7.0 you can also use URI to start Remote Desktop sessions with support for every command line option RDP+ supports. This enables you to start sessions using hyperlinks on webpages or from password managers like KeePass. In which the parameters are any of the supported RDP+ command line parameters. RDP+ normally only has two command line parameters without a /-prefix : The connection file and the @-switch for the commandfile. When launching through a URI you can specify those parameters using file= and commandfile= respectively. rdp Connection.rdp @Commands.rdpc /v:192.168.0.107 /mon:2 /u:DOMAIN\User /p:[email protected]! /nodrives /fit:35 /o:"disable themes=i:1″ /programtitle:"Session for %USERNAME%"
You can set all of the ‘slashed’ command line options as the default option for Remote Desktop Plus by setting the user environment variable RDP. For example, you can set RDP to /fit /mon:2 /noprinters /drives:fixed. When you set /mon to a number higher than the number of monitors attached to your computer, RDP+ will automatically fall back to monitor 1. This means you can safely set it to 2 if you always want your session to start in the second monitor when it is available. Default options can also be set using the registry key HKEY_CURRENT_USER\Software\Remote Desktop Plus\DefaultOptions or HKEY_LOCAL_MACHINE\Software\Remote Desktop Plus\DefaultOptions. The default options can of course be overruled from the command line. Either by entering an opposing or overruling option (/printers vs. /noprinters, or /fit vs. /max), or (as of RDP 6.2) by using the negating /- option. For example: /-title will negate /title:"Something". Another option to set default options is placing a command file called Default.rdpc in your Documents folder, similar to the Default.rdp file from Remote Desktop Connection. Some of the behavior of Remote Desktop Plus can be controlled through Group Policies or registry settings. More information about this can be found on this page. Value of HKEY_LOCAL_MACHINE\Software\Remote Desktop Plus\DefaultOptions. Content of the Deafult.rdpc file in your Documents folder. Value of the environment variable RDP. Content of the command file. Machine part of Group Policy setting (Computer Configuration). User part of Group Policy settings (User Configuration). You can localize RDP+ for your own language using a customizable XML file. In the download section you will find a Dutch template (language_nl.xml) which you can use to create your own translation. Once you’re done, save it in the directory containing rdp.exe and replace the template part in the file name with the two letter (ISO 639-1) language code for the language your computer is running. For example: language_de.xml for German. Note: Starting with version 7.0, the format of the XML file has changed drastically. If you previously made your own language file, you’ll have to recreate it for 7.0. When starting Remote Desktop Plus from a script, you can use the option /batch to prevent RDP+ from displaying error messages. Instead you can catch potential errors through the exit codes (errorlevels) which RDP+ raises. 2: Specified connection file not found. 5: Target computer not in the list of allowed targets. 29: Cannot write to the log file. 87: Invalid command line parameter or combination of command line parameters. 161: The format of the specified path is invalid (filename of the connection file, log file or command options file). 259: No responsive server found in the list (when using /lb). 2382: Invalid notation of the specified host name or IP address. 10060: Connection timed out to the specified server. 11001: Remote hostname not found. Please not that exit codes are only raised when RDP+ is either started with its own /wait command line switch or when you launch RDP+ from a script using the appropiate syntax to wait for completion. Remote Desktop Plus is FREE to use for home, personal or corporate use. You may use and distribute the program free of charge for both commercial and non-commercial purposes, as long as end users are not charged a fee of any kind for its use. If you want to show your appreciation and make a difference in this world, then please consider making a donation to a reputable charity, like these for example. 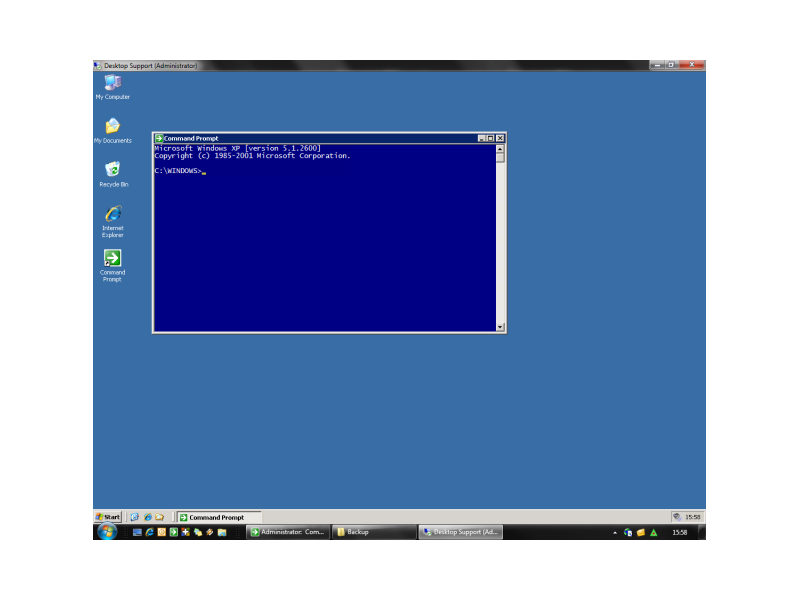 The standalone executable for Remote Desktop Plus. No installation required. Install the main executable for RDP+ in the Program Files folder. Put a shortcut in the Start Menu. Register the .rdpc file extension for RDP+ command files. Import the URI scheme for hyperlink support. 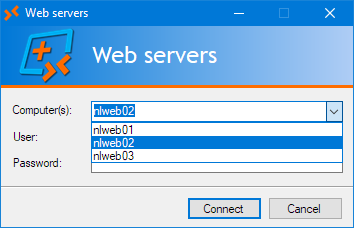 Add a ‘Connect with Remote Desktop Plus’ context menu to servers in the network browser. Check the downloads page for all available downloads. Do NOT follow this link or you will be blocked from the site!